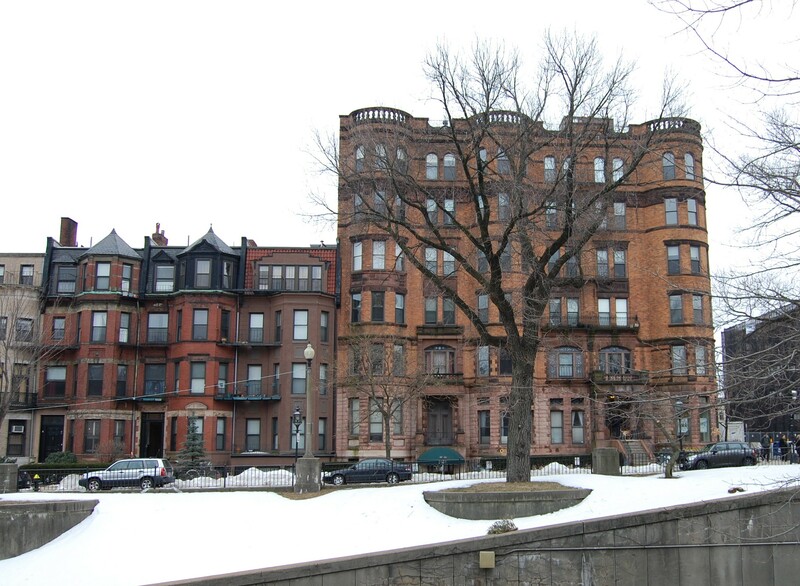 358 Commonwealth is located on the south side of Commonwealth, between Hereford and Massachusetts Avenue, with 356 Commonwealth to the east and 360 Commonwealth to the west. 358 Commonwealth was designed by Obed F. Smith, architect, and built in 1883-1884 by Vinal & Dodge, masons, for building contractor George Wheatland, Jr. for speculative sale. He is shown as the owner on the original building permit application, dated November 30, 1883. The house was originally numbered 356 Commonwealth until about 1889, when 328 Commonwealth was built and the houses to the west of it were renumbered. 358 Commonwealth was one of thirteen houses (336-360 Commonwealth) built for George Wheatland, Jr., by Warren D. Vinal and Charles A. Dodge on land owned by Charles Merriam and by Jacob Rogers. 336 Commonwealth was designed by George Avery, 338-340 Commonwealth were designed by Bradlee, Winslow, and Wetherell, and 342-360 Commonwealth were designed by Obed F. Smith. 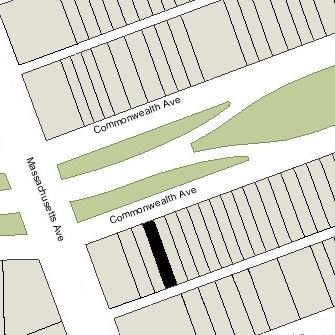 Click here for an index to the deeds for 358 Commonwealth, and click here for further information on the land on the south side of Commonwealth between Hereford and Massachusetts Avenue. On December 4, 1884, Jacob Rogers sold George Wheatland, Jr., the land where 358 Commonwealth was built. On August 15, 1885, 358 Commonwealth was purchased from George Wheatland, Jr., by Job Abiel Turner. He and his wife, Vesta Howard (Torrey) Turner Turner, lived in Newton (Vesta Turner had previously been married to Job A. Turner’s second cousin, Albion Turner, who had died in 1853). Job Turner was treasurer of the George F. Blake Manufacturing Company, which manufactured steam pumps and water meters. Job Turner purchased the house for his son and daughter-in-law, Albion Bryant Turner and Mary Alice (Rawson) Turner, who had married in January of 1885. On August 28, 1885, he transferred the property to Mary Turner. Albion Turner was a clerk with the George F. Blake Manufacturing Company. In about 1887, he joined with his brother-in-law, George A. Rawson, and Botsford Ralph Clarke, a mechanical engineer, to form Turner, Clarke & Rawson, developers of water works systems. He later became a banker and broker. 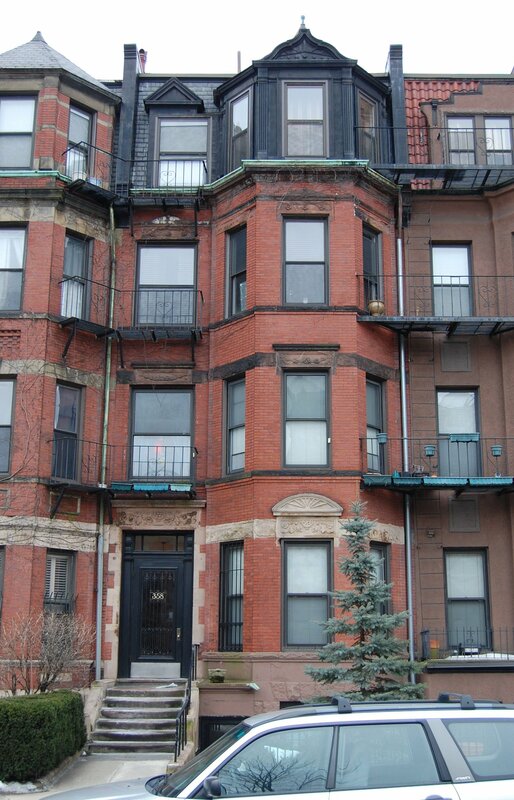 Albion and Mary Alice Turner continued to live at 358 Commonwealth during the 1886-1887 winter season, but moved thereafter to 457 Beacon. On December 7, 1887, 358 Commonwealth was purchased from Mary Alice Turner by Arthur D. McClellan, an attorney. He and his wife, Mary A. (Townsend) McClellan, made it their home. They had lived next door, at 356 Commonwealth, during the previous season. They continued to live at 358 Commonwealth during the 1889-1890 winter season, but moved thereafter to the Hotel Vendôme. During the 1890-1891 winter season, 358 Commonwealth was the home of Wallace Lincoln Pierce and his wife, Stella Louise (Walworth) Pierce. They previously had lived in Milton. Wallace Pierce was a partner in and later president of the S. S. Pierce Company, importers and retail dealers in groceries, founded by his father, Samuel Stillman Pierce. By 1892, they were again living in Milton. On May 20, 1891, 358 Commonwealth was purchased from Arthur McClellan by George Fordyce Blake, owner of the George F. Blake Manufacturing Company, the company for which Job A. Turner had been treasurer. George F. Blake and his wife, Martha Jane (Skinner) Blake, lived in Belmont; in June of 1892, they purchased and subsequently moved to 196 Commonwealth. 358 Commonwealth became the home of George Blake’s son and daughter-in-law, George Fordyce Blake, Jr., and Carrie Howard (Turner) Blake. Carrie Blake was the daughter of Job and Vesta Turner. George Blake, Jr., was an iron and steel merchant. They previously had lived in Worcester. Job A. Turner had died in March of 1886 and Carrie Blake’s mother, Vesta Howard (Torrey) Turner Turner, lived with them. The Blakes and Mrs. Turner continued to live at 358 Commonwealth during the 1894-1895 winter season. 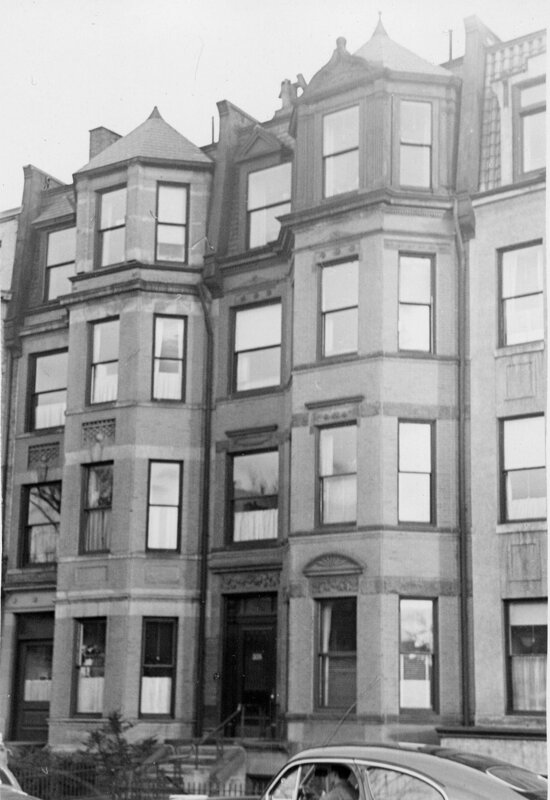 By 1896, the Blakes had moved back to Worcester and Mrs. Turner was living at the Hotel Brunswick (southeast corner of Clarendon and Boylston). 358 Commonwealth was not listed in the 1896 Blue Book. On May 13, 1896, 358 Commonwealth was purchased from George F. Blake by Lester Leland, Jr., as trustee of a trust established by his mother, Mary Elizabeth (Babcock) Leland, the widow of Lester Leland, to manage her property. Lester Leland, Jr., was officer of several rubber manufacturing companies. He and his wife, Frances Eugenia (Converse) Leland, lived at 1 Raleigh and later at 422 Beacon. 358 Commonwealth became Mary Elizabeth Leland’s home. She previously had lived at 162 West Canton. Her son-in-law and daughter, Dr. Orren Burnham Sanders and Florence Josephine (Leland) Sanders, lived with her. He was a homeopathic physician and also maintained his office at 358 Commonwealth. They previously had lived (and he had maintained his office) at 370 Columbus. Mary Leland died in November of 1905 and on December 19, 1905, Lester Leland transferred 358 Commonwealth to Florence Sanders. She and her husband continued to live at 358 Commonwealth. Orren Sanders died in September of 1913, killed in an automobile accident, and Florence Sanders died in October of 1913. They had no children and 358 Commonwealth was inherited by her brother, Lester Leland. 358 Commonwealth was not listed in the Blue Books after 1913. On April 17, 1920, 358 Commonwealth was acquired from Lester Leland by Dr. William Henry Gilpatric. He and his wife, Carolyn Draper (Nutt) Gilpatric, lived in Winchester. On June 29, 1920, he transferred the property into his wife’s name, and in July of 1920 she acquired 356 Commonwealth..
William Gilpatric was a dentist specializing in orthodontia, and he converted 356-358 Commonwealth into dental offices. In June of 1920, Dr. Gilpatric filed for (and subsequently received) permission to convert 358 Commonwealth from an office and single-family dwelling into three dental offices and “habitation.” In July of 1920, he filed for (and subsequently received) permission to convert 356 Commonwealth from offices and lodgings into dental offices. As part of the applications, he also received permission to cut doors in the party wall between the two buildings, on the first floor. On July 30, 1926, Carolyn Gilpatric transferred 356-358 Commonwealth into her and her husband’s names. In April of 1928, the Gilpatrics acquired 360 Commonwealth, and that same month they applied for (and subsequently received) permission to remodel the interior, including cutting four doors in the party wall connecting with 358 Commonwealth. The building’s use was shown as being dental offices. In December of 1988, he filed for (and subsequently received) permission to convert 356 Commonwealth into ten apartments and 358 Commonwealth into nine apartments, and at the same time to consolidate the two buildings as one property, with nineteen units. In May of 1989, he filed for (and subsequently received) permission to convert 356-358 Commonwealth into one office and nineteen apartments. In February of 1992, Robert White filed for (and subsequently received) permission to increase the number of apartments at 356-358 Commonwealth from nineteen to twenty-one by converting the office into two apartments.